Mel, myself, and Ashley from left to right - picture taken by Ashley (@abhinton on IG) - is this real?!? Are we actually here together?! A crazy idea popped into my head last week. Why not make a quilt for Ashley? Why not? I know how much she loves Chicopee, and I had some scraps, and as usual, I was itching for a new project... so I went all in. I was sewing on Sunday with my friend Amy (like literally, I was piecing the backing for this mini quilt and getting ready to baste) when I saw that Ashley had posted her Sunday Stash post. She talked about how much Chicopee she had and her plans for it. Number 1? X-plus blocks. I think my jaw actually dropped. Can you believe our brains? Now, this was even more exciting. When I originally put the four x-plus blocks together (using a great tutorial by City Stitches), the colors really clashed. Shudder. There was just too much going on. However, these were the only Chicopee fabrics I had, so I powered on. Mike helped me decide on Kona Medium Gray to make it more modern and break up the colors. Of course, the next dilemma (this feels like a melodrama) was the quilting. What could I do to make the blocks stand out and combine with the gray simultaneously? I did some pebbling in the in-betweens and stitched-in-the-ditch around all x's, mirroring in the middle (oh and gosh, that was really tough - I hardly every SITD). I really loved creating a whole other layer to the quilt through the gray - that's my favorite part now! 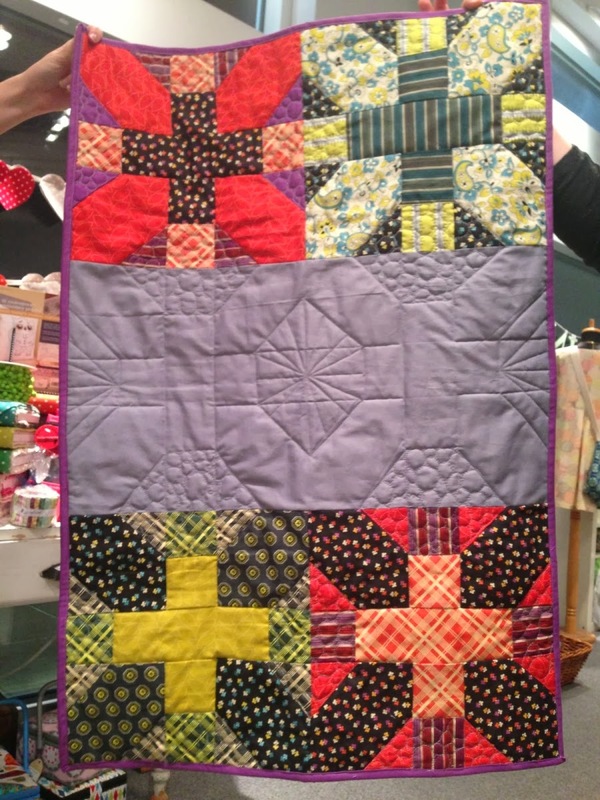 I wanted the quilting in the very middle to especially stand out, so I took some gemstone inspiration from Sarah. By the way, I used my new Hera Marker to make the creases in the fabric before quilting - it worked perfectly. Just passing on how awesome it is! And, Ashley agreed that you can never go wrong with purple binding. 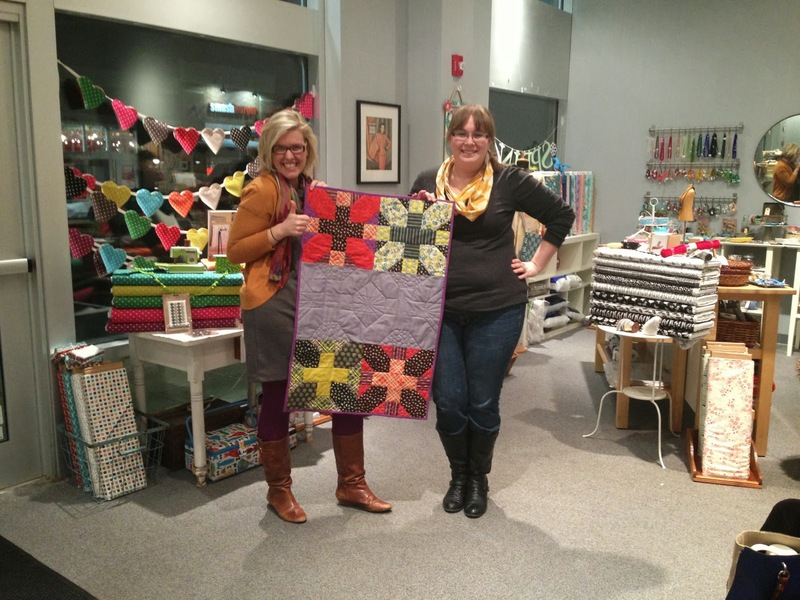 I couldn't wait to give this quilt to Ashley last night! Let me tell you how cool it was to meet her in person finally! I was almost literally jumping with excitement (can you confirm, Ashley?). First I passed over my Sisterhood of the Traveling Quilts starter (post to come, but it's on IG if you are curious), and then I pulled out the present! She loved it and I'm so glad (P.S. the name of the quilt is because it's her adored fabric!). Success. And so ends the saga. :) Thanks for understanding my preoccupation with the bolts of Dowry while the meeting was going on, friend! 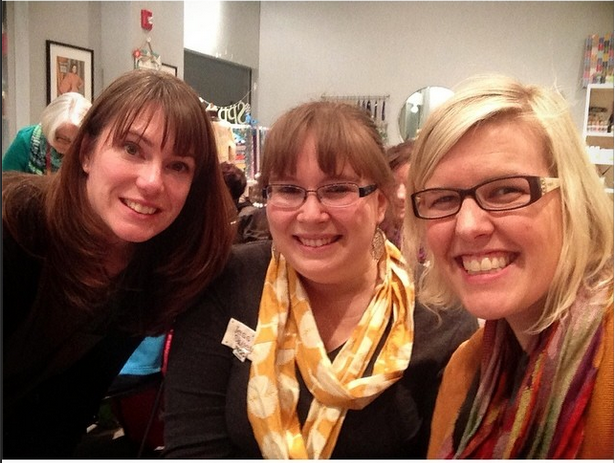 The meeting was so inspiring and fun! On my way there, the last thing I felt like doing was sewing (it was kind of a crazy week and I had just finished this and a couple of other projects), but on my way back, I was itching to play with fabric. Thanks to everyone in the NJMQG for welcoming me! I hope we can all sew/hang out soon :) And for now, I'll keep surprising my friends with quilts... who's next? You never know. I did NOT expect to see myself there! Hello! It was so awesome to see you guys meet each other, and to meet you as well. I'm not a native New Jerseyan, but you guys make me so happy to live here. What a fun and special quilt! 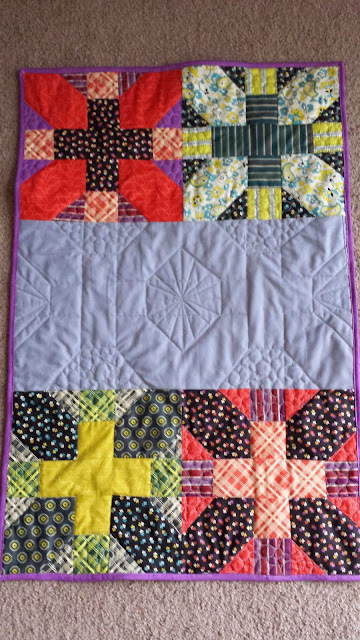 I especially like how you added the grey and the quilting you chose is fantastic! It really does pull it all together. super cute mini, and it looks like y'all had tons of fun getting to meet each other. Janet from Simply Pieced and I are both in Memphis and see each other pretty often, and we have talked before about how cool it would be to get to meet more of our quilty blog friends in person! 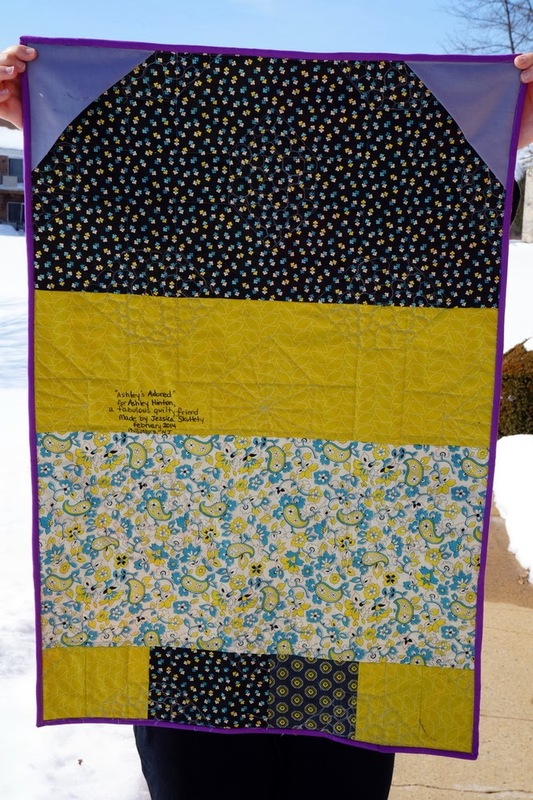 Love how the quilting replicates the blocks in the solid!! Neat! I can see from the pics how much you all enjoyed it. Such a great story!!! And an even better quilt! How exciting! It is so great to see you all together in 'real' life. Your mini quilt is spectacular! 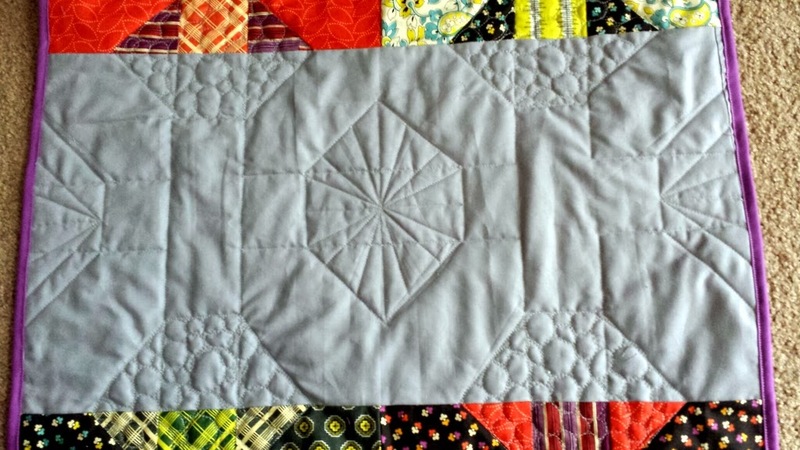 I love the x and + block and your quilting in the gray is brilliant. Thanks so much for sharing! Awesome! The quilt, the story, the surprise for your friend. Giving sure does make for a great day! What a lovely quilt - thanks for linking up to TGIFF! You girls are so cute! 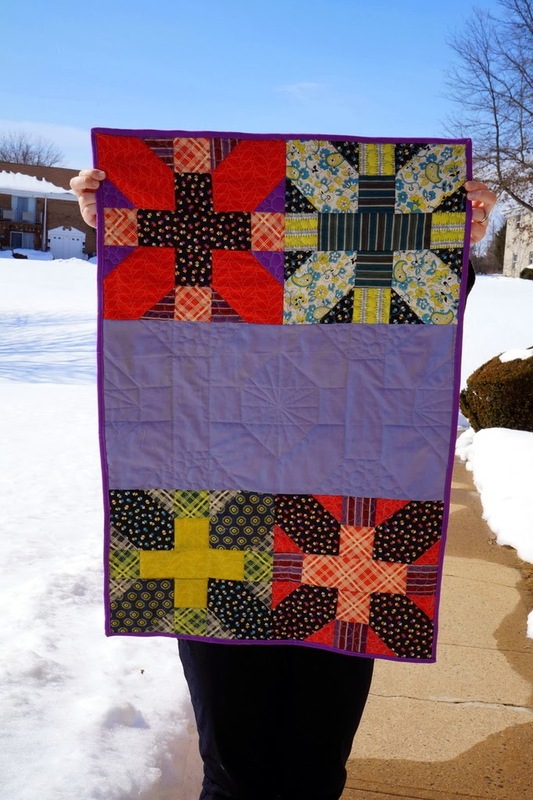 Your mini quilt came out great, Jess! It looks lovely!! And I can't wait to visit Rock, Paper, Scissors. You had me at "bolts of Dowry"!! You are the sweetest friend! I love my quilt and I keep petting it! Thank you so much for thinking of me - can't tell you how much this gift means to me! Awesome!! You nailed it Jess! I agree that the quilting is a great accomplishment! What a wonderful gift for Ashley! I've been following her blog and I adore her too!